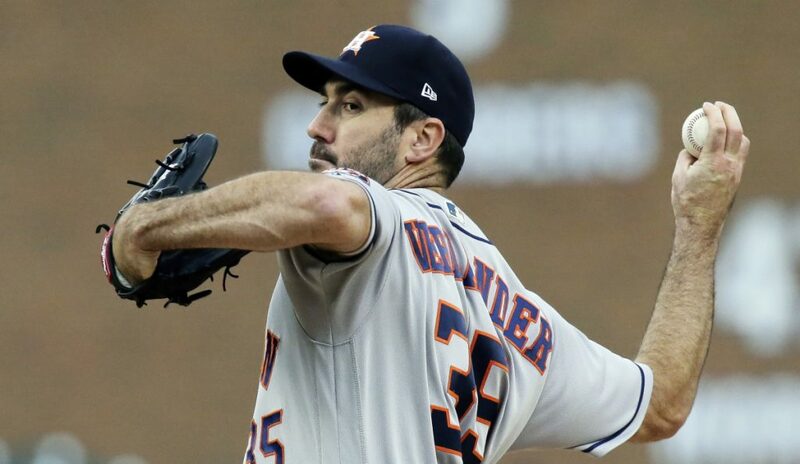 Justin Verlander strikes out 10 in seven innings, leading the Astros to a 3-2 victory. Verlander struck out 10 in his first game in Detroit since being traded to Houston in August 2017. The defending World Series champion Astros opened a three-game lead over Oakland atop the AL West. Francisco Liriano (4-10) allowed three unearned runs on four hits and four walks in six innings. He struck out seven in his longest outing since July 4. REDS 10, DODGERS 6: Scooter Gennett had four hits and three RBI, Joey Votto hit a two-run double on his birthday and Cincinnati improved to 5-0 against the Dodgers with a win at home. Eugenio Suarez added a solo home run for the last-place Reds, and Jose Peraza had two hits and scored three runs. That helped Cincinnati overcome Chris Taylor’s two-run homer and Yasmani Grandal’s solo shot. Gennett, second in the NL in hitting going into the game, went 4 for 5 to boost his batting average to .320. Milwaukee outfielder Christian Yelich began the night leading the league at .316. YANKEES: Outfielder Aaron Judge took on-field batting practice Monday for the first time since breaking his right wrist July 26. Assuming Judge feels good Tuesday, Boone said he anticipates Judge will take more swings, potentially during group batting practice, but Boone could not put a timetable on Judge’s return. CUBS: Closer Brandon Morrow and outfielder Jason Heyward took small strides toward rejoining the team before the end of the regular season. Heyward, who hasn’t played since suffering a strained right hamstring on Aug. 30, ran outside for the first time under the supervision of the Cubs medical staff. He has continued to play catch and take batting practice. ANGELS: First baseman Albert Pujols will undergo surgery to remove a bone spur in his throwing elbow Wednesday, just two weeks after having season-ending arthroscopic surgery on his left knee. The recovery time for both procedures is four to six weeks, which should give the 38-year-old slugger enough time to complete his normal offseason workout regimen in preparation for 2019.